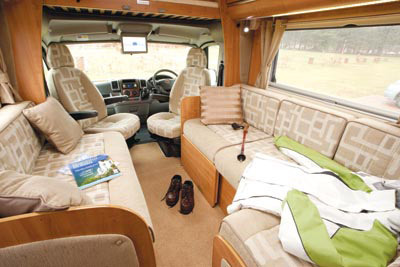 The Apache 725 is a great family motorhome. The lounge is an ingenious design that allows you to adapt it in the course of use. When you are travelling, you remove a seating section to give legroom forward of the two belted seats that form an L-shape to the lounge. Once you’ve arrived, you can put that section back – and you have an L-shaped settee and, opposite, a two-seater settee. Factor in the swivelling cab seats and you easily have seating for seven. This clever design extends into the kitchen too where the L-shape creates so much space that you could easily make meals for the seven you can seat in the lounge. While the dark grey granite-effect surface looks classy it’s the amount of storage space that will impress you most. A cupboard and two deep drawers can be found to the right of the cooker. 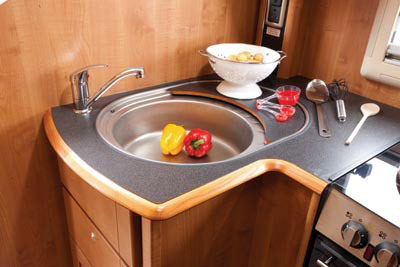 To the left, the under-sink unit gives you a large and well-fitted cutlery drawer, a two-shelf cupboard and a flip-down aperture to the under-sink area. The 725 was designed with kids in mind. At the rear, tucked away behind the fridge-freezer, are two permanent bunks with a storage cavern beneath. It’s a cohesive hide-away children’s bedroom – and there is enough head-height for both bunks for adult use. The quality trail now leads you into the washroom, with separate shower. A large towel rail curves its way across the forward wall. More curves define the head-height cabinet. And lighting in here is strips of tiny LED bulbs. Lighting is a feature of the living area, too. Those LED strips appear above the wardrobe, disguised above the top lockers of the kitchen and lounge, under the kitchen locker and, more prominently, above the habitation door. As only four can travel in the 725, it’s probable that parents would sleep in the over-cab bed, kids in the bunks – and that leaves the lounge-dining area intact. But if you have two more, you can make up a double bed in the lounge, by pulling out bed bases from both sides. But if you opt for this, bear in mind that the occupants of the over-cab double can’t put the ladder in place with the bed below made up… I guess it’s a case of who goes to bed first, who gets up first, who doesn’t mind someone descending onto them while they’re asleep if the upstairs occupants want to get up first. Work it out for yourselves. The important thing here is that you have options – lots of them. This motorhome is large enough to be truly spacious, yet it isn’t a daunting drive. 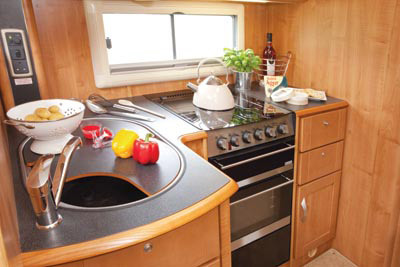 Rounded cabinets, beautiful wood grain, a lounge layout that you can change to suit your needs, a fantastic big kitchen – and somewhere for the kids to sleep in their own area make for a great motorhome. 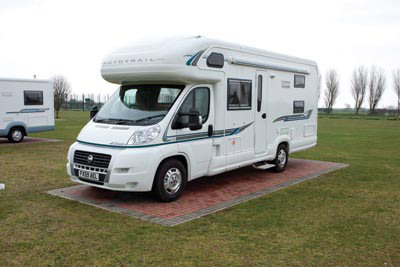 *Motorhome insurance cost based on 2010 Auto-Trail Apache 725 SE valued at £47,463. Fitted with Thatcham Category 1 alarm and manufacturers immobiliser, kept at home at TD9 8BD. Motorhome owners – professionals over 50 years old with no claims, convictions or health conditions in last 3 years. 4 years no claims bonus mirrored from car policy and 2 years motorhome driving experience. Members of motorhome club doing less than 7000 miles annually. £250 excess applies. European cover £17, European Breakdown £42 extra. Premiums include insurance premium tax at 5% and are correct as of 14.07.10.